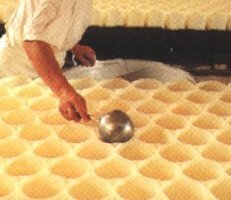 The method described in this page should be followed by dairies that receive the AOC (Appelation d'Origine Controlée), a special french trade name, given to producers (not only in the cheese-making industry) who respect a high level of quality. It takes approximately two days, following this method, to make a camembert. During the whole process, the milk temperature should not rise over 37 ºC (98.6 ºF). First, whole milk is poured into large containers called "bassines normandes" (Norman bowls). The aim of that stage is to make the milk coagulate/curdle. In conditions that are different in every dairy, the rennet* is added to the milk, and one should wait 1h20 before the beginning of the next step. At the end of that period, the milk has formed into curds. *Rennet is an enzyme that reduces the time necessary to separate the liquids from the solids. Then comes the moulding. This is particular to camembert, because the curdled milk should be put in the mould with a special ladle, in at least four time (That operation lasts often more than 4 hours!). Extreme caution should be taken to prevent the curds from being shaken. The next step is rather easy in comparison. The curds are perfectly levelled in the mould. 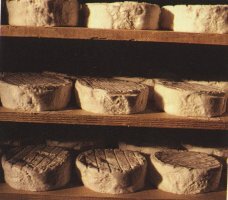 To drain off whey, the futur camembert is put on shelves, for four to five hours and then turned over. 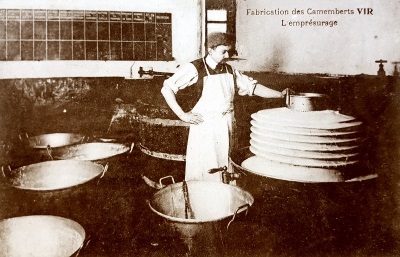 The next morning, the camembert, which has now its final shape, is taken out of its mould, and set on a tray in a salting room. There, it is covered on both sides with a thin layer of salt and finally with a precious fungus "penicillium candidum". That fungus replaced the genuine "penicillium camembertii" that was sometimes responsible of blue moistures on the cheese. The active part of the making is now over... Nevertheless, the camembert is not yet ready for consumption, it should be placed on special shelves "les haloirs" for approximately 12 days . Finally it is packed in its famous wood box, and sent to the consumers. After 21 days, it is said to be "affiné" (refined) and "à point", 30 to 35 days after its birth. The moulding should be done with a ladle in at least four times. The size of the laddle should be approximately the same as the size of the mould. The salt should only be a "dry" one ( in french "sel sec"). At least 45% fat content in a camembert. At least 115g of dry matter in a camembert. The whole process is controlled by a specific commission composed of veterinarians, milk quality specialists, producers and members of the french administration. This commission tests the quality of the product in the farms and at each step of the making until the cheese merchants receive it.